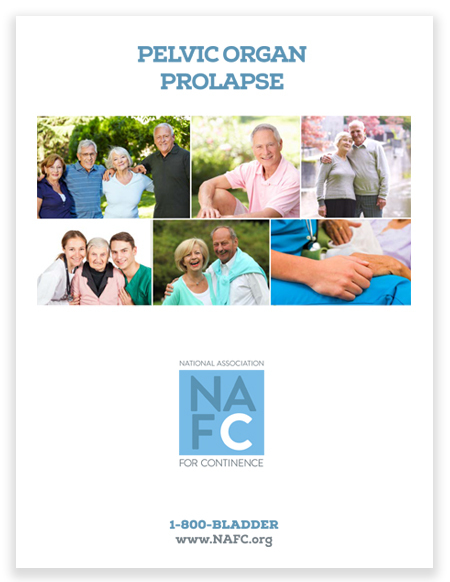 The NAFC Learning Library was created to provide you with the most up-to-date information on incontinence conditions, treatments and management techniques from some of the best minds around. Click any of the links below to jump to the appropriate section of this page for video presentations and free downloadable guides. If you prefer professionally printed copies of the booklets, brochures and other materials we've produced, you'll find that many of them available for free or at nominal cost - simply click here to visit our ordering page to get yours today. This brochure will give you all the information you need about bedwetting, why it happens and how you can manage it. Click the image above for your free copy. It's never easy to talk to someone about something as personal as bedwetting, even a physician. If you're struggling with how to talk to your doctor about this sensitive topic, this is the brochure for you. Click the image above for your free copy. Bedwetting can bring on a whole host of concerns, including questions about how to keep things clean and sanitary. Click the image above for your free guide on how to keep your bed and your home smelling fresh. This short and simple questionnaire can be invaluable when it comes to helping you and your doctor determine the causes of your bedwetting and develop an effective plan to help you stay dry. Click the image above for your fee copy. One of the most useful things you can do to treat your bedwetting issues is to keep a careful record. This easy-to-use tool can be of great value to the program you and your doctor develop to manage your condition. Click the image above for your free copy. This simple guide lists many of the most common foods and beverages that can contribute to incontinence. It's a great sheet to have handy so you can avoid those everyday items that might exacerbate your condition. Click the image above for your free copy. 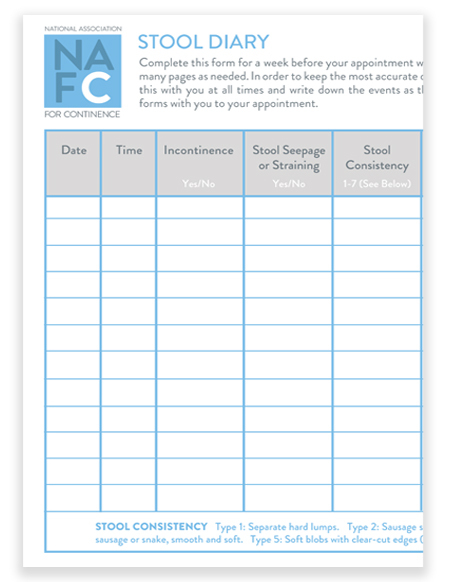 Click the image above for your free bowel continence diary. Keeping a record of your bowel habits can help you better understand the nature of your condition and give your physician important guidance for diagnosis. Click the image above for your free guide to bowel incontinence. It contains important, relevant and easy-to-understand information about the causes and treatment options for bowel-related issues. Those who care for others with incontinence face unique challenges. This guide offers insights an strategies to help you provide the best care possible for your loved ones while also caring for yourself. Click the image at left to download your free copy today. Talking about incontinence isn't always easy, even when discussing things with a physician. This short questionnaire has been developed to help you make the most out of your next consultation. Click the image above for your free download. The National Association for Continence presents the appropriate way for women to self-catheterize. Self-catheterization doesn't have to be difficult, as you'll learn from this video presented by a clinical nurse. Learn from a clinical nurse specialist how to properly do your pelvic muscle exercises. Click the video at left for an easy-to-understand, highly informative guide. The following videos offer encouragement, insight and useful guidance from everyday people dealing with incontinence challenges. Click any of them to see how their experiences can help you better manage your own symptoms. Hear firsthand how one brave MS sufferer overcame her incontinence symptoms. Hear and learn more from a real MS patient who refused to let incontinence get in her way. If you have a neurological condition that contributes to incontinence, take this guide with you to your next appointment and use these questions to direct your conversation – you’ll find that an open, honest discussion is makes it much easier for you and your doctor to find a solution that’s right for you. Managing incontinence in children with disabilities requires a distinct approach. 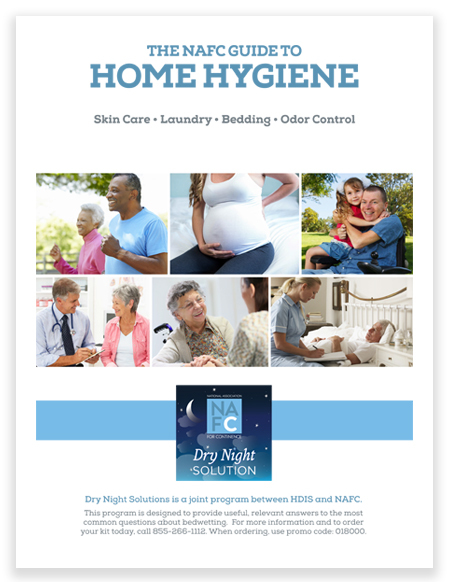 This guide has been developed specifically to help you better address incontinence symptoms in your loved ones and improve their quality of life. The videos below offer presentations by medical professionals on a range of incontinence-related topics. They're filled with valuable, reliable information that can help you better understand your condition and how it can be most effectively managed. Do you get up multiple times at night to go to the bathroom? That could be a real medical condition called Nocturia - click here to learn more about it. Frequent nighttime urination isn't something that you just have to live with. There are real, effective treatments available - click here to learn more. 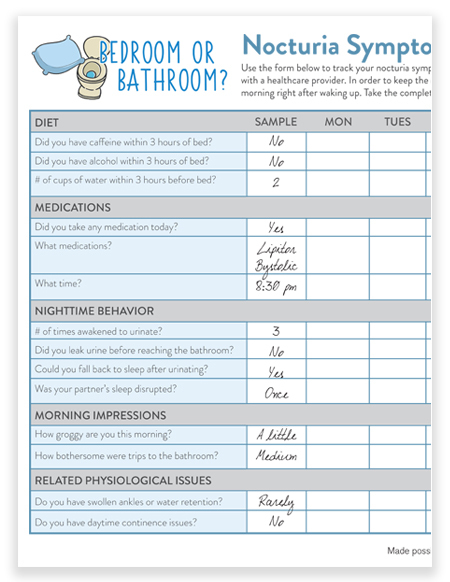 This free, downloadable tracking sheet is a great way to help manage and treat your nocturia - it will give you important information to better understand your condition, and your physician will find it incredibly useful in the diagnostic process. Click the image at left for your free download today. This free, downloadable sheet explains all about what you can expect from your next doctor’s visit. Be sure to print out this handy tool to prepare yourself for the questions he or she may ask you during your appointment. Click the image above to begin your download now. Over the course of the six short videos below, you'll be introduced to all the key concepts you'll want to know about OAB, including information about the nature of the condition, how you can manage it most effectively and the treatment options you're likely to encounter. Everything is presented in simple, everyday language that you can relate to, minimizing confusion and giving you the insight you need to have a productive conversation with caregivers, healthcare professionals and others who can help you address your symptoms. Your Introduction to OAB, detailing the care pathway you're likely to encounter as you seek treatment. You can begin treating symptoms yourself by making some simple lifestyle changes. There are more products out there than you can imagine. This guide can help you figure out what's right for you. If medications and injections don't work for you, other minimally invasive therapies are available. Medical treatments for OAB are more effective than ever - here's a sense of what your doctor may suggest for you. For conditions that aren't responding well to other forms of treatment, surgery may be a good option. If you're suffering from overactive bladder, this 30-minute video offers important information to help you address your condition. Presented by Dr. Scott MacDiarmid, you'll find an easy-to-understand discussion of key issues that can make a meaningful difference in your quality of life. Click on any of the images below to open a full, downloadable copy of the file - you'll be able to read them right online or print them out to review and use at your convenience. Make sure to take any questionnaires, diaries or guides with you to your next physician's appointment to provide fuller information about your condition and to help lead your conversation in the most productive direction possible. This is a great resource to help you discover all the different ways there are to treat OAB. Just because one hasn't worked for you, it doesn't mean it's the end of the line. With the Care Pathway, you’ll be able to see the all treatment options available! This easy, 8-question screener is a great tool to evaluate just how severe your symptoms are. Your answers can help your doctor provide an accurate diagnosis and determine the best treatment options available to you. Finding the right incontinence treatment can be difficult, but did you know there are things you can do to improve your symptoms before you even visit your doctor? This Step-By-Step Guide offers an easy-to-understand overview of your options. Click here for your free brochure, It’s Time To Go… Talking to Your Doctor About Overactive Bladder. It’s a detailed overview of the condition and includes important questions to ask your doctor to make sure you receive the treatment you deserve. Most people don't think of the bladder as a muscle, but it is. And like any muscle, you can train it to become stronger. Retraining can even help you condition your bladder to hold more fluid for longer periods of time. This guide walks you through a simple, 6-week retraining process. This short, handy guide offers hints, tips and strategies for you to make your bladder retraining process as successful as possible. Click the image above to download your free pamphlet today. 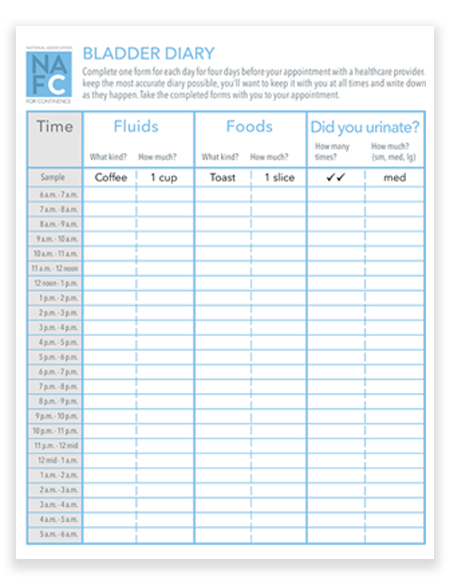 Click here for your free bladder diary. It’s an important tool to keep track of your bladder habits - you’ll be able to see trends over time, and that can give your doctor a much clearer understanding of your condition. 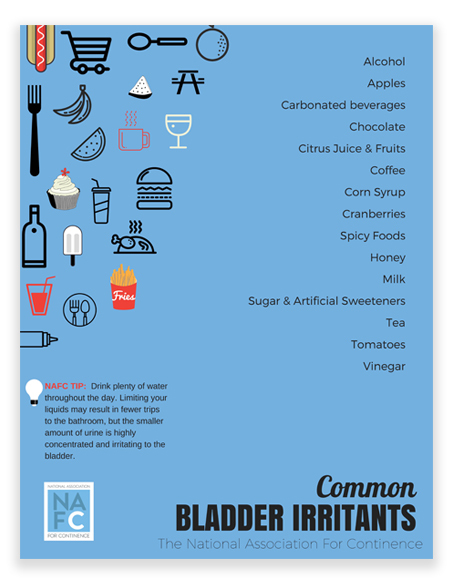 This simple guide lists many of the most common foods and beverages that can contribute to incontinence. It's a great sheet to have handy so you can avoid those everyday items that might exacerbate your condition. Click the image at left for your free, downloadable guide to pelvic organ prolapse. You'll learn all about its causes and find a range of treatment options, including procedures that can help reduce or even eliminate your symptoms of incontinence. Click the image above to download your free guide on female stress urinary incontinence, with an emphasis on surgical procedures that can deliver significant relief. Click the image above to download your free guide on male stress urinary incontinence. You'll learn important information about its causes and treatment options. Dr. Eric Rovner presents an overview of the mid-urethral sling procedure for the treatment of incontinence in women. Click the image at left to view this informative overview. Urogynecologist Jill Rabin, MD, discusses the causes, risk factors and treatment options for UTIs. Click the video at left to view this important presentation. Click on any of the images below to read our most recent blog posts. Our B-Health blog contains an enormous number of articles, including advice from experts, perspectives from real people struggling with incontinence, insights and information to help you better manage your own circumstances and much, much more. To search our entire blog, click here.